UFC 200, which occurred in July of this year, was supposed to go down as the greatest fight card in the organization’s history. Unfortunately, this landmark card was battered by injuries and PED busts until it had deflated from a great card to a pretty good one. We’ve been much luckier in the case of UFC 205, the November 12 card that will mark the Octagon’s long-awaited debut in New York City, New York. Barring a small shakeup in the withdrawal of undercard fighter Lyman Good, who was forced out of a planned bout with Belal Muhammed due to a potential USADA violation, the card has gone almost entirely unscathed. Unfortunately, that changed Tuesday evening, as former light heavyweight champion Rashad Evans was forced out of an undercard bout with former Strikeforce star Tim Kennedy. The bout was intended to be Evans’ first in the middleweight division. Despite immediate speculation that his withdrawal from the card had something to do with his cut to the middleweight division, this is actually not the case. According to Evans, who spoke to MMAFighting.com in the wake of his withdrawal from the card, this grim twist can be attributed to “irregular findings” revealed by an October 19 MRI. While he claims to have passed additional tests without a hitch, the New York State Athletic Commission opted not to gamble which his health, which resulted in his removal from the card. 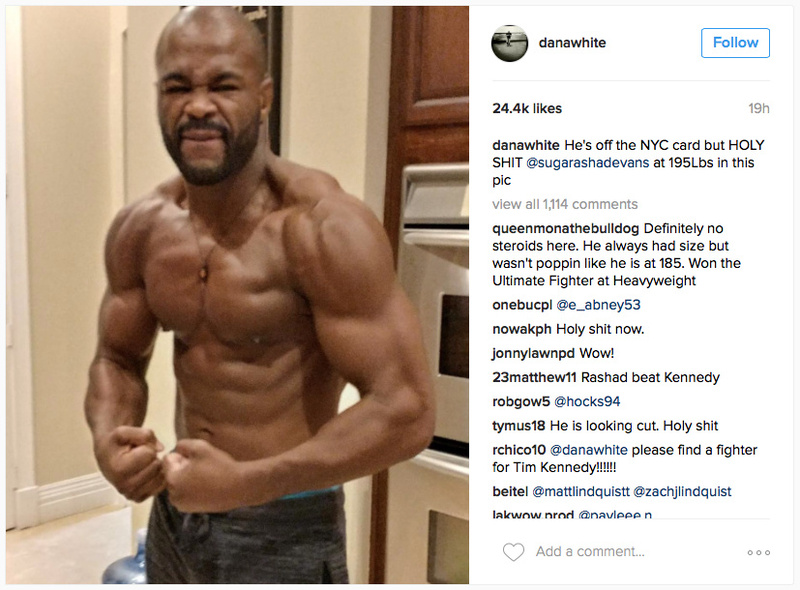 "I'm disappointed," Evans told MMA Fighting. "I'm healthy. I don't want anyone worrying about me. I'm fine, physically speaking. Never felt better. It's just the commission and their rules. I guess they have a zero tolerance policy when it comes to this." In the wake of Evans’ withdrawal from the card, Kennedy quickly took to social media in a ditch effort to seek out a last minute replacement. These efforts saw him call out stars like middleweight champ Michael Bisping, and welterweight legend Nick Diaz. During the chaos, hot-and-cold middleweight Sam Alvey threw his name in the hat as a possible Evans replacement, while former UFC fighter Phil “The New York Badass” Baroni also attempted to shoehorn himself into a fight with Kennedy. 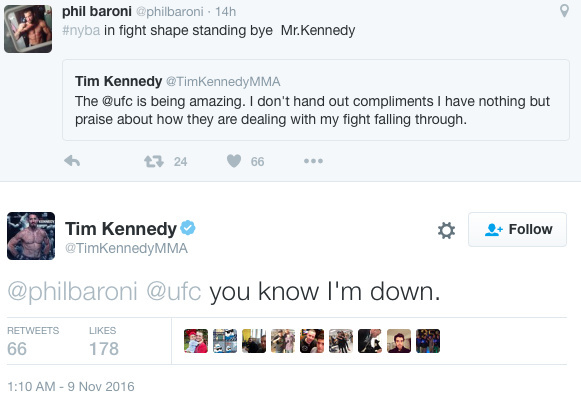 Regrettably, the UFC opted to scrap the fight altogether, leaving Kennedy without a fight on this historic fight card. This, unsurprisingly, is bound to sting quite a bit for Kennedy. The middleweight contender was vocal in his hope that a victory over Evans would earn him a rematch with middleweight champ Michael Bisping, who defeated by unanimous decision back in 2014. While the realization of this hope certainly seemed unlikely from the get-go, Kennedy’s being left without an opponent makes it downright impossible. Given that Kennedy stated he’d consider retiring if a win over Evans didn’t earn him a title shot, its hard to say what his removal from the UFC 205 bill will mean for his continued career. Evans, meanwhile, seems optimistic about a return in the near future. 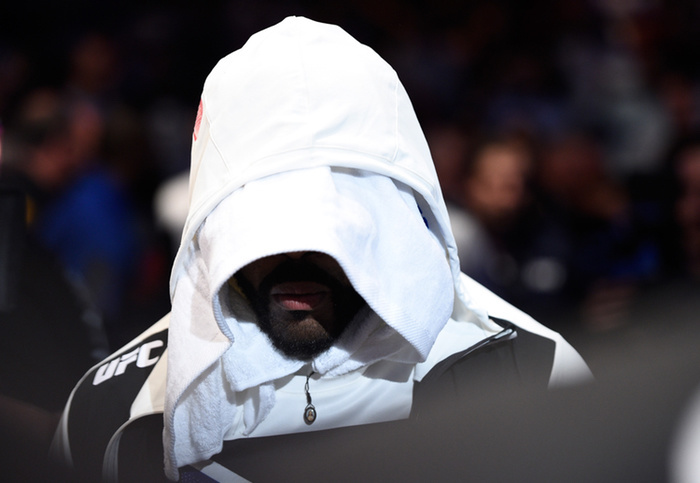 "This doesn't change the fact that I want to fight,” the former champ told MMA Fighting. “This doesn't change anything for me as far as fighting." Whatever the future holds for these two talented fighters, both can take solace in the fact that they’ll receive their show money for this bout. When we last saw Evans in action, he was knocked stiff by light heavyweight contender Glover Teixeira. Kennedy, meanwhile, also experienced a knockout loss in his last bout, having been levelled by Yoel Romero in a controversial 2014 bout. He has not been seen in the Octagon since. Hopefully, this is the last shakeup that the UFC 205 lineup experiences. Knock on wood, fight fans.